Is Your Company Prepared for Minimum Wage Increases Coming July 1st? Minimum Wage Increases Are Coming July 1: Is Your Company Prepared? 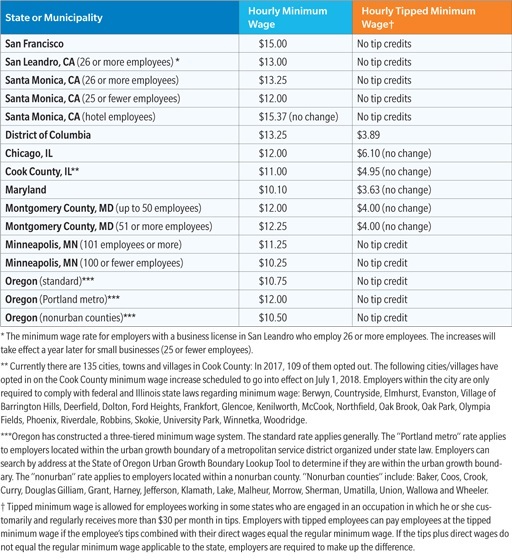 Several states and municipalities are increasing their minimum wage rates for non-exempt employees as of July 1, 2018. While it may seem like a no-brainer that some of your employees’ wages will need to be increased to meet these new requirements, there are other considerations that your company will want to address. Gather a list of the employees who will be affected by the increase. The list should include those employees who are currently making below the new minimum wage as well as those employees who are making more than the minimum wage. You may want to increase the wages of employees who already meet or exceed the incoming minimum wage requirements to maintain consistency with your pay scale. Pay increases should depend on factors like experience, education, time with the company, level of duties, supervisory responsibilities, etc. Once those determinations are made, you can perform an analysis to determine the impact this pay increase will have on your company’s bottom line. Think of things you can do now to minimize the effect wage increases may have on potential profits. Could it mean an increase to the price for some of the goods or services you provide? Do you need to look at staffing levels in your organization and make some adjustments? Work with your internal departments to design budgets and identify areas where spending can be reduced or eliminated. The cost to replace an employee far outweighs the cost of keeping them. According to Deloitte, the cost of replacing one employee can be up to twice that employee’s annual salary. This is why working with a comprehensive professional employer organization (PEO) or HR services provider that can offer access to competitive employee benefits plans and retirement services, as well as help you create an effective company culture, can be a worthwhile investment. In addition to cutting the costs of replacing employees, investing resources in employee salary, benefits and professional growth opportunities can create an engaged workforce. This influences customer satisfaction and, in turn, can have a positive impact on your bottom line. Keep in mind that the increases to the minimum wage won’t just affect your company. Your competitors are also facing the same requirements. You can gain an advantage by being proactive. Ultimately, minimum wage increases are coming and several states, including Arizona, California, Colorado, Maine, New York, Oregon and Rhode Island, as well as the District of Columbia, have already passed legislation requiring incremental increases to their respective minimum wages over the next few years. It’s more important than ever to plan ahead and approach these increases with a strategic vision. Taking steps to manage the increases now will save your company a lot of headache down the road.